Written by Denise Deby. Thanks to Leela Ramachandran, Manager of Farm Programs at Just Food, for information. Interested in knowing what goes into running a very small (and profitable) organic farm? 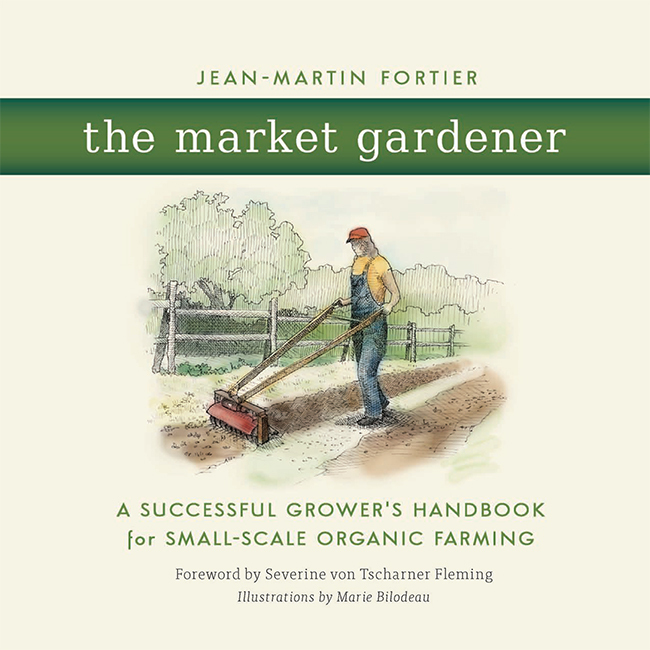 Just Food is hosting the launch of The Market Gardener: A Handbook for Small-Scale Organic Farming (New Society Publishers, 2014), with author, farmer and local food systems advocate Jean-Martin Fortier. Jean-Martin and his wife, Maude-Hélène Desroches, run Les Jardins de la Grelinette, a Québec micro-farm. It’s a pretty interesting story: Jean-Martin and Maude-Hélène explain that they feed more than 200 families and support their household on their 1.5 acres, using low-tech, high-yield methods (and almost no fossil fuels) to supply produce for their CSA shares and market stands. You can find out more about their farm on their website. The launch is on Thursday, Feb. 20, 7 p.m. at Dominion-Chalmers United Church, 355 Cooper St. (doors open 6:30 p.m.) $5 admission. Copies of the book will be available to buy. Since I live in Ottawa and know what it’s like to market a book on food and healthy eating in this town, I shared your link on my Facebook page. Good luck at your launch!